Today I was busy moving and dividing hosta in my yard. One of the hosta that needed to be rescued was my Squash Casserole. It has grown leaps and bounds since last year, along with the hostas around it. 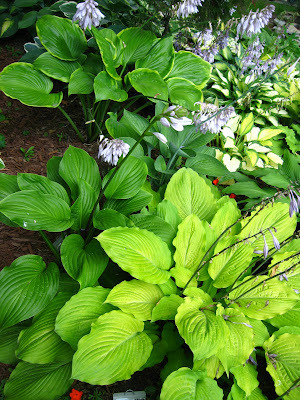 So I had to move and divide the hostas around it, as it was hidden among them. I love this hosta, as it has pie crusts edges and a beautiful gold/green color. Last year my hostas were severely damaged by hail in early July, but obviously that didn't effect them negatively since most of them are double their size from last year. Pretty photos - I don't have Squash Casserole, maybe one to get next year.